The Duquesa Charitable Society of St. George 2018 Children’s Gift Appeal has just been launched and the charity needs your donations to achieve their target to provide gifts for around 500 local underprivileged children this festive season. 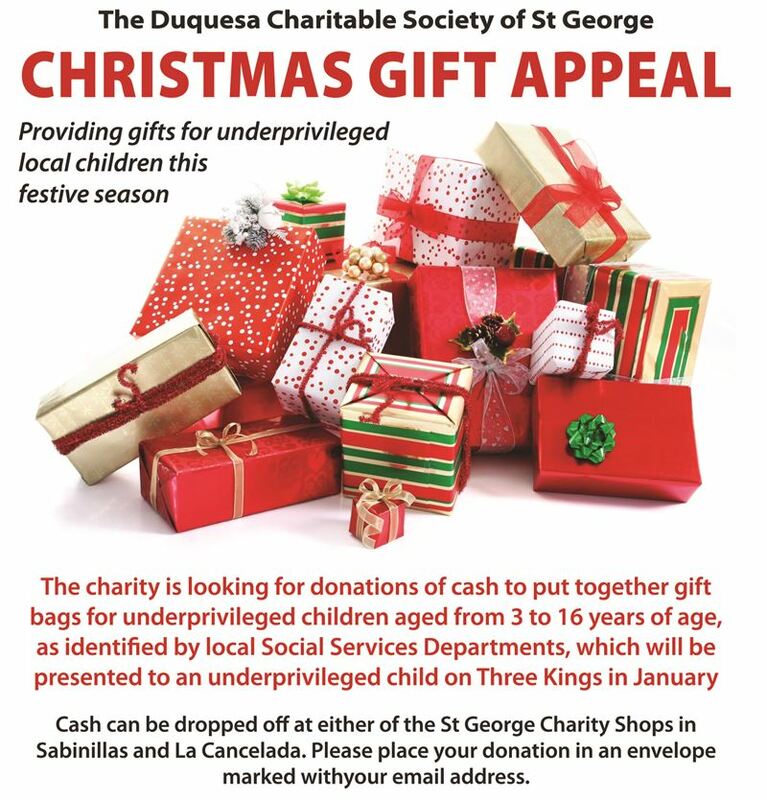 The St George charity is looking for donations of cash, which will then used to put together gift bags for underprivileged children aged from 3 to 16 years of age as identified by the local Social Services Departments in Manilva and Casares, and the Emaus Social Kitchen in Estepona. Last year the charity provided gift bags for around 490 children. Cash donations can be made at the St George Charity’s shops in Calle Duquesa de Arcos (opposite O’Callaghans) and in Plaza de las Naranjas, Sabinillas as well as the newly opened shop in Avenida Marqués del Duero, 9, Cancelada, Estepona. Cash should be placed in a sealed envelope and marked with your name and email address so that we can send you a confirmation of receipt, or they can be paid directly into the charity’s bank account: Caixa Bank. Duquesa Charitable Society of St George Account No: (ES40) 2100 2671 77 0210252624. Alternatively you can make your donation online via our Christmas Gift Campaign on GoFundMe www.gofundme.com/stgeorgexmas2018. Please give generously – all the money will go to providing gift bags which will be presented to underprivileged children on Three Kings in January, and know that your generosity has brought a smile to a child’s face this festive season.